An explosive device detonated on Tuesday on a railway track in St. Petersburg, slightly injuring a train driver, investigators said. The blast occurred at 04:15 (01:15 GMT) and hit a maintenance rail car on the Bronevaya-Ligovo line near St. Petersburg's Baltic Station. The train driver suffered a leg injury. The bomb exploded with the power of 200 grams of TNT and left a crater one meter in diameter, but failed to seriously damage the train. A criminal investigation has been opened. 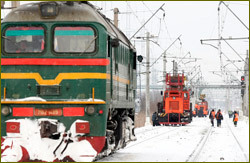 Rail traffic was halted on the line, but was resumed later on Tuesday, Russian Railways said. The incident comes two months after the luxury high-speed Nevsky Express between Moscow and St. Petersburg was derailed by an explosion, killing 27 passengers and injuring more than 90. City news archive for 03 February' 2010. City news archive for February' 2010.